Zombies of Dead Island beware, PC gamers are coming for you, and they have a new toy. While you'll be able to pick up the PC version of Dead Island via a number of digital distribution networks, only one offers a nifty pre-order bonus. Pre-ordering the game on Steam nets players a new weapon called "the Ripper," and access to new area in the game. The Ripper is exclusive to Steam - at least on PC - and is a combination of a baseball bat and a circular saw, which will undoubtedly be rather handy for dispatching zombies in a quick and messy fashion. Anyone who pre-orders the game on Steam will also be to grab the "Bloodbath Arena" DLC, in which players can fight wave after waves of zombies in four different arenas. Players can gain experience and win items in the arenas which they can carry over to the main game. Console players will also be able to get their hands on the Ripper and on the Arena by pre-ordering at specific retailers. Dead Island first caught gamers' attention with a very powerful teaser trailer featuring a little girl both killing and being killed by her father as zombies burst into their hotel room. 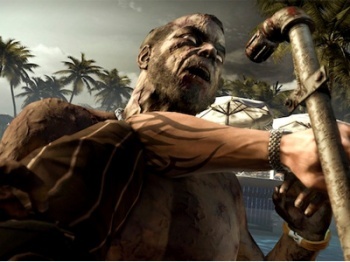 Publisher Deep Silver actually had to play down the trailer after it became clear that it didn't properly represent Dead Island's gameplay.